Table 10 team representing the Marist College at the NISO quiz recently in AIT including Edward Clarke, Jack Mullally and Josh Earley. 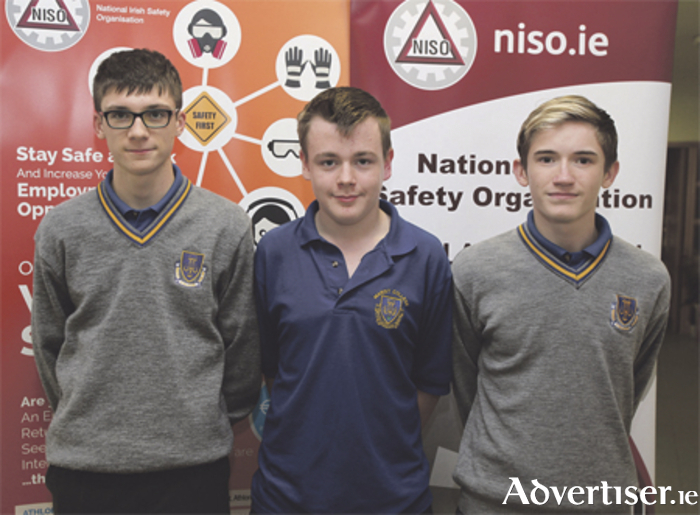 Local school teams performed well at the second National TY Schools Safety Table Quiz, organised by the Midlands branch of the National Irish Safety Organisation (NISO ) and hosted by AIT. Eleven teams completed for the trophy and prizes including Our Lady’s Bower Secondary, Moate Community, Athlone Community School, Mercy Secondary School, Ballymahon and the Marist College. The winning team, from Athlone Community College, consisted of Adam Cummins, John Feeney and Brian Kelly. The Moate Community School team of Tara Geoghegan, Lauren Lawlor and Ciara Maxwell were runners up, followed by two Our Lady’s Bower teams in third and fourth place. The winning team members each received an electronic tablet, a €100 cheque and a trophy, along with a trophy for the school. The runners up team members each received a €50 cheque, a sports voucher and a trophy, along with a trophy for the school. NISO is a voluntary organisation who have promoted safety in the workplace for more than 50 years. They run courses on safety nationally, an annual All Ireland company safety quiz - hosted in Athlone in 2015 - and the All Ireland safety awards ceremony - hosted in Athlone in 2016. This year the NISO Midland branch initiated the TY safety table quiz to promote safety in the workplace among young people namely. It is loosely based on the annual company-focused NISO Safety Table Quiz. The 2017 final was hosted by AIT on October 19.